The Stitch Me Up Embroidery Blog Hop is over. What fun! 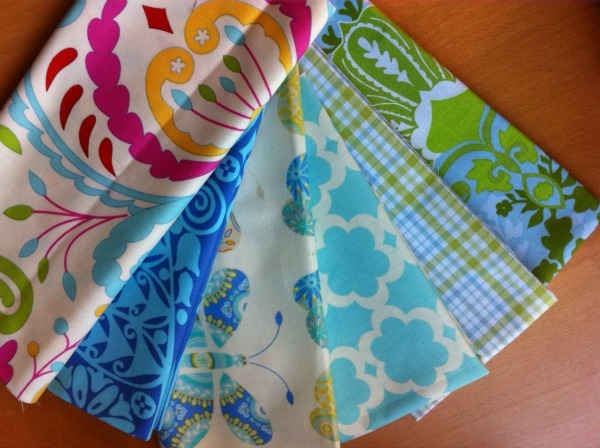 I pulled some fabrics from my stash to give to one of my new followers. The Random Number Generator says it is number 23. That would be Barb from Bejeweled Quilts! 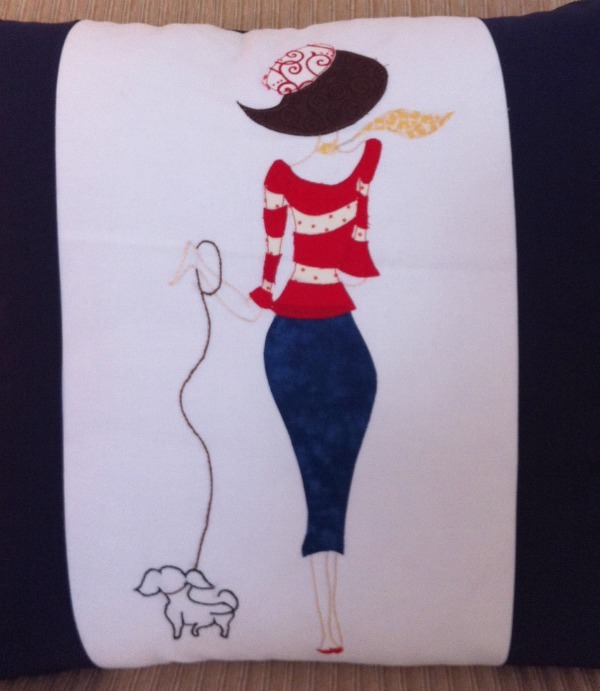 Stitch Me Up – Embroidery Blog Hop Today! 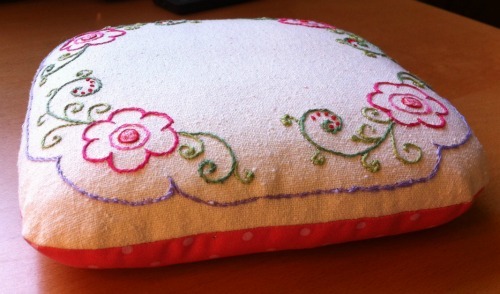 A 16-inch pillow for the sofa. 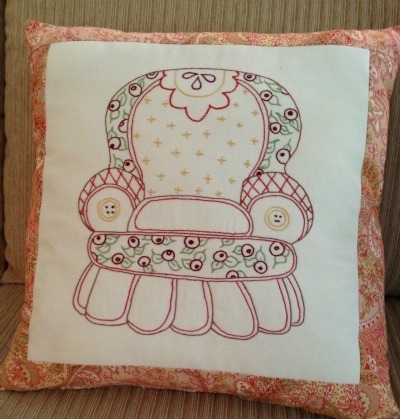 This darling overstuffed chair design reminds me of Mary Engelbreit’s work. 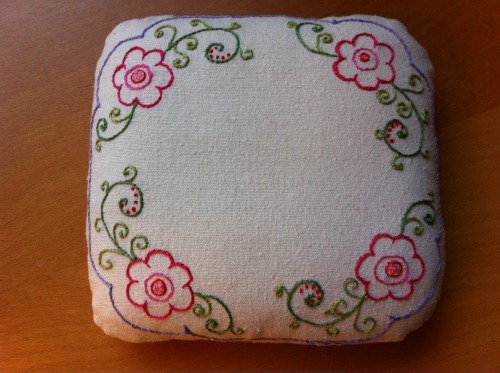 A five-inch square pincushion for my sewing room. I love this little floral pattern. I used a raw linen fabric and like the way the embroidery looks on the textured surface. I think this one is my favorite. It was so fun to work on. 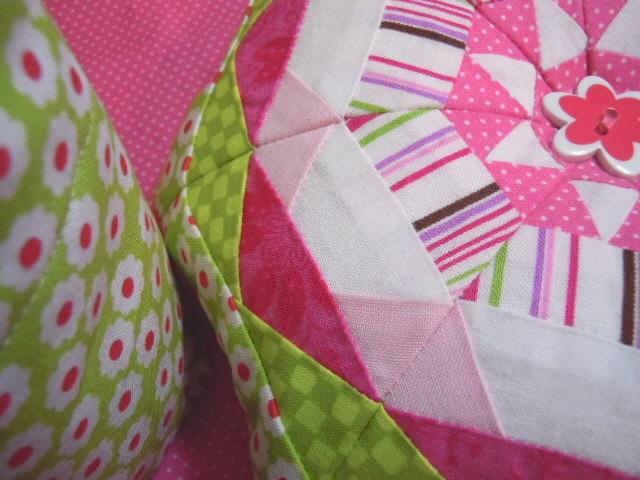 I adapted the embroidery design and filled some areas with raw-edge applique to fill the spaces and give it more color. This is an 18-inch pillow. The borders are the same fabric as the girl’s skirt, but they look black in the photo for some reason. Madam Samm drew this design and I just love it. Such attitude! I am celebrating the hop with a little give-away. Follow my blog and leave a comment and you are entered. I will use the random number generator on the last day of the hop to pick the winner. Thank you so much for visiting me today, and I hope you will visit again! I joined an Add-a-Border Swap this week. I have been watching the group on Flickr and have been amazed by some of the blocks being made, so I decided to jump in and give it a try. Unlike other swaps and bees, there are no time constraints or expectations about participation. You do what you want, when you want, so it is very flexible. The concept for the swap is to send in a six-inch starter block which is then sent to someone else in the group. That person adds a six-inch border to the block, making it 12 inches. 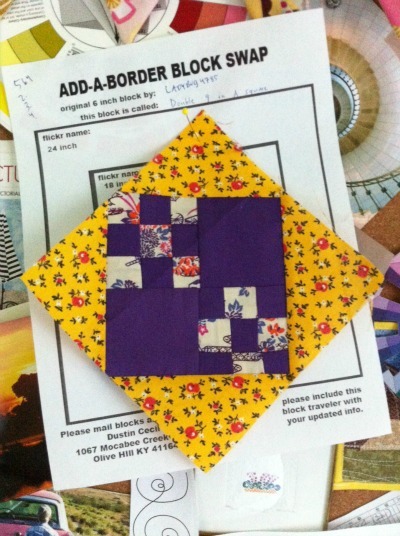 The block is sent on to the next person who adds another six-inch border, making it 18 inches. It is sent to the last person in the round, who adds an additional six inches, making it a 24 inch block. At that point, anyone who has completed a round can ask to keep the block. You rarely get your own block back. 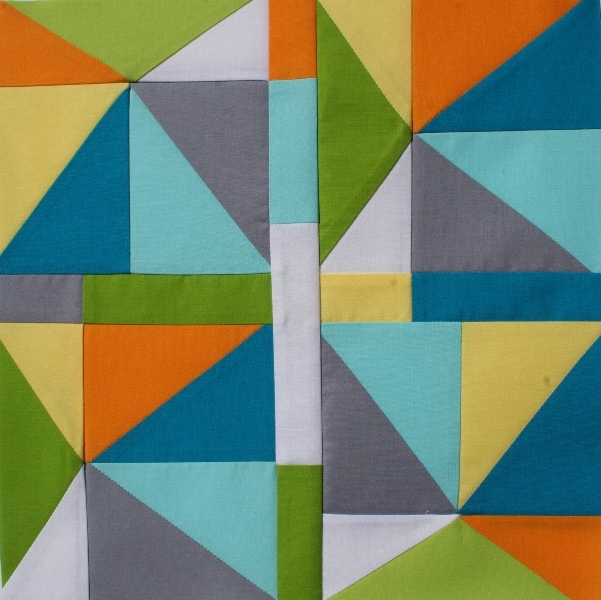 Some of the blocks grow into an entire quilt. I am looking forward to seeing what the group does with this. This is the block I received. I will need to come up with a six-inch border for it. I have already decided I like it on point, so now I am off to find some coordinating fabrics and start brainstorming a border! This idea is genius! FabMo is a re-distribution center in a small warehouse space at 2423 Old Middlefield Way in Mountain View, California. The founders, Jonathan and Hannah Cranch, came up with this idea after visiting the Design Center in San Francisco. Hannah asked one of the decorators what they did with the out-dated samples and was told they were put in the trash and sent to the landfill. 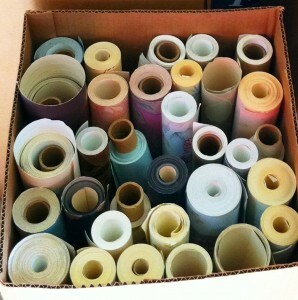 Jonathan and Hannah were sure there had to be some use for the fabric samples, and FabMo was born. 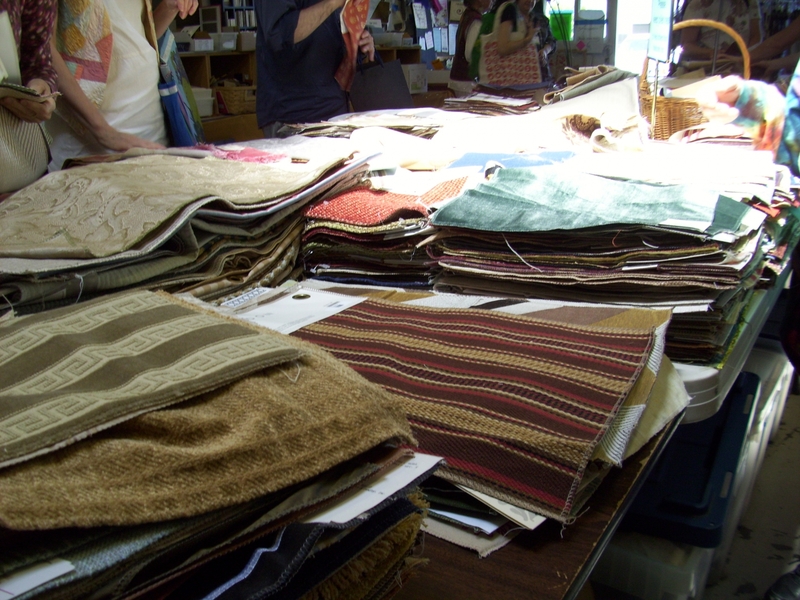 Each month a group of volunteers gather at the warehouse to take apart the sample books, sort the fabrics by swatch size, and organize the various other items that have been brought in. The selection varies month to month. The center opens for three days each month and the public is invited in to select items for re-use and can take them home for free. You must make an appointment to attend, which is easily accomplished online, and are assigned a 45 minute time slot. This keeps the room from over-crowding, which is nice. Every 15 to 20 minutes, new things are brought from the back, so the items are continually being refreshed. I had seen a reference to FabMo on Studio Art Quilt’s website and after checking out FabMo’s website, I decided to attend their March event. 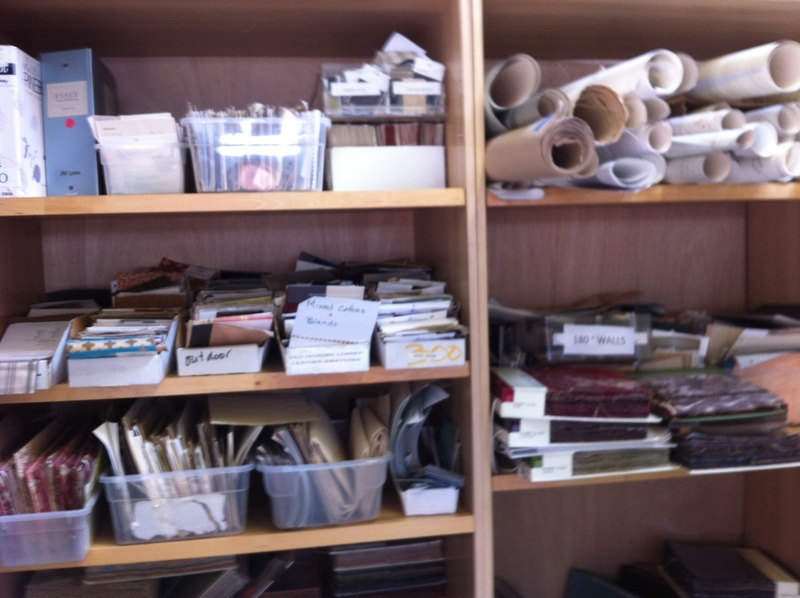 I was expecting the stacks of fabric in neat piles on the tables in the center of the room, but I was amazed at the variety of other items also available. Stacks of ceramic tile, large pieces of cross-stitch net, beautiful wallpaper, buttons, pieces of trim, and a zipper that had to have been ten yards long. I spent a sizeable amount of my appointment time just wandering around the room looking at everything. There were six other people in the room, mostly crafters. 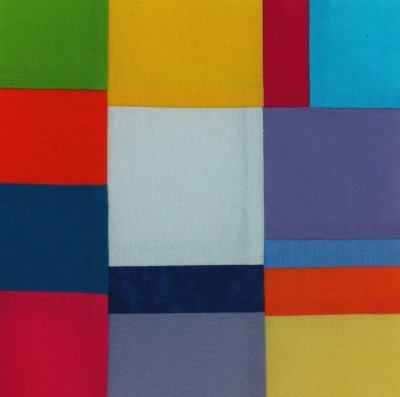 One woman was looking for large fabric samples to make sit-upons for her daughter’s Girl Scout Troop. A young grad student from Stanford was looking for things to use in her handbag-making business that provides her with extra income. I found several yards of beautiful linen and a large piece of raw silk folded neatly on a bookshelf. Once it dawned on me that my time was running out, I settled in to the task of looking for 100 percent cotton in the fabric piles. The fabrics are not separated by content, so the cottons are mingled with upholstery fabric and blends, so a little patience is required. These are the lovely things that made their way into my bag. 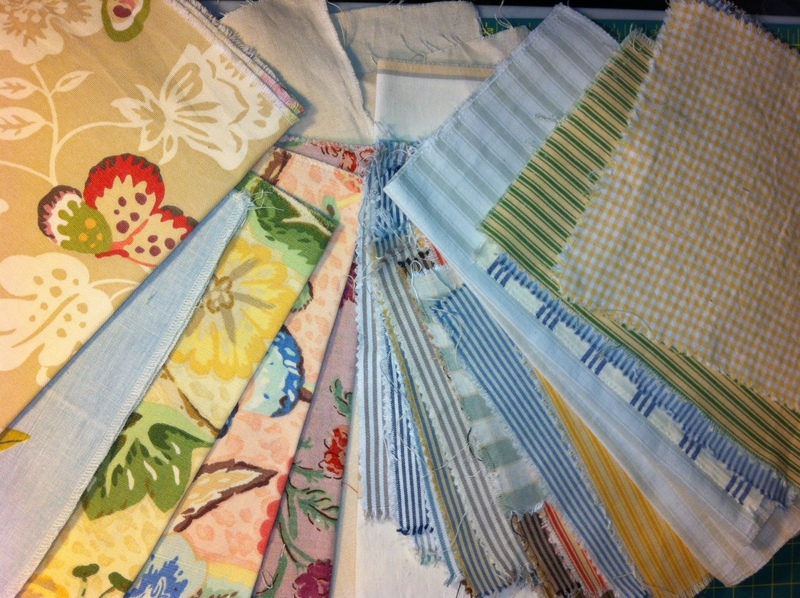 Several pieces of pretty linen came home with me. I found dozens of stripes of varying scale. I already have an idea for using them. So, I am off to sew with my FabMo booty and look forward to visiting them again. There are a number of similar re-use projects that have sprung up around the country in the last few years, so check to see if there might be one near you.